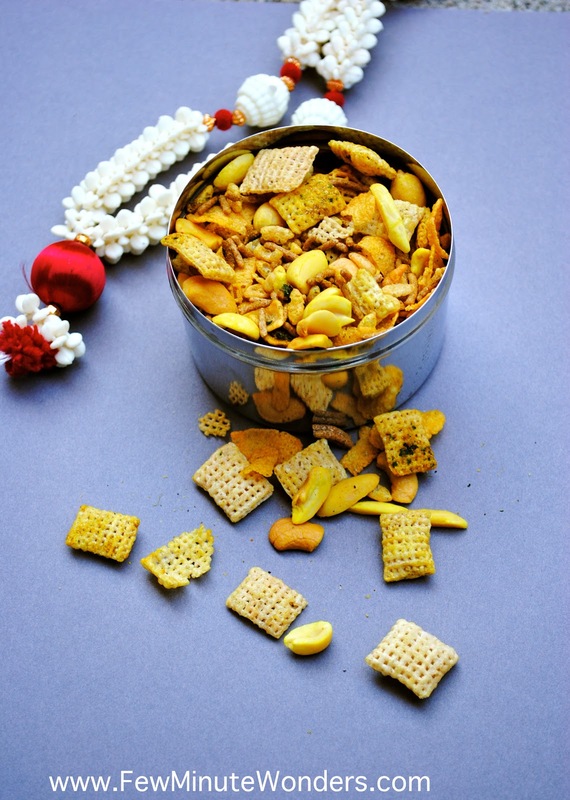 Deepavali is around the corner and its the time of the year to indulge in sweets and savories. Though most of the goodies are available in stores these days, I still like to make something at home for my family and friends. Everybody is getting so health conscious and prefer baked instead of deep fried goodies. For me, the only reason I like making savory crunches, is to enjoy them with sambar or thair sadham on Deepavali day. It is the perfect thing to have after eating a lot of sweets on that day. This year, I have decided to make cereal based mixture, but it has a lot more of cilantro flavor to it and its baked. A trip to Trader Joe's and Target can get you set to prepare the mixture. 1. Set the oven at 220 Degrees F. In a big bowl, add all the cereals, nuts and give it a mix. 2. Heat the seasoning wok with oil, add asafoetida, allow for it to get fried well. Add curry leaves, cilantro, turmeric and chilli powder. Cook until the cilantro get toasted a bit. Remove from heat and transfer to a blender. 3. Blend the mix. Add this mixture to the cereal mix and keep mixing well. Transfer to a cookie tray and spread evenly. 4. Place in the oven and allow to get toasted for 30 minutes. Add salt if required. Remove, cool and store in an air tight container. How flavourful and very tempting mixture, looks stunning.